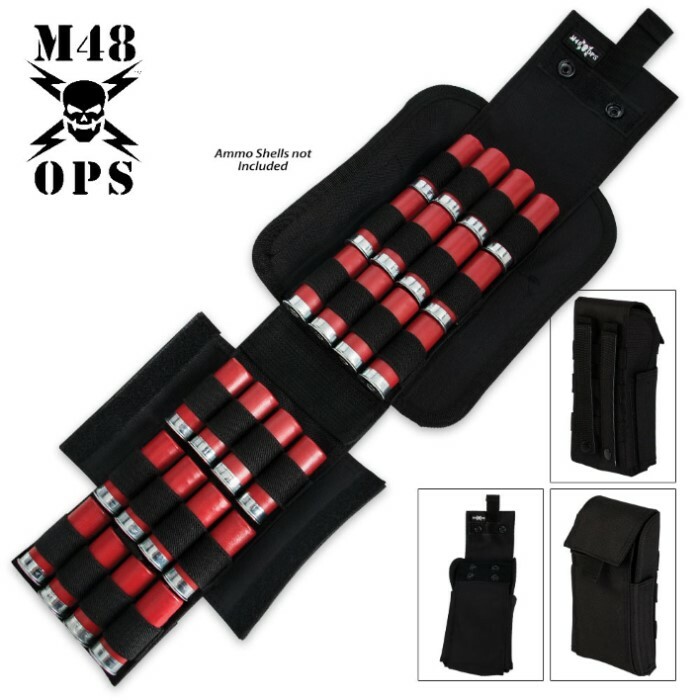 MOLLE Shotgun / Airsoft Ammo Pouch | BUDK.com - Knives & Swords At The Lowest Prices! Pros: it holds 24 - 2-3/4" shells very well. It folds up nicely, the velcro sides hold well, the molle webbing looks strong, and it closed without an issue. This loses a star for me because adding the 25th shell is essentially impossible. There's one more loop to add the shell sandwiched between two of the main rows of shells. It's not practical to try and jam it in there and I can't imagine that I'd get the pouch to clasp after doing so. There are two sets of snaps, presumably one for longer shells and one for shorter shells so that the pouch is always holding the shells in tight. Just using 2-3/4" shells forces me to use the longest set of snaps, and that is a snug fit to make it close. That's perfect for me, but 3" shells would likely be nearly impossible to close and anything longer just plain wouldn't have a change at closing at all. In my opinion, this should not be advertised to hold a full box and it should have a disclaimer that larger shells may not fit. Does not hold a full box (25) of 3" or 3 1/2" shells. Snaps on top do not line up/ do not function properly. Defective.